The technical field of the present invention relates to a stable pharmaceutical composition comprising ethinyl estradiol. The present invention also relates to a process for preparation of a stable pharmaceutical composition comprising ethinyl estradiol. The present invention further relates to a stable pharmaceutical composition comprising ethinyl estradiol and progestogen. The present invention relates to a stable pharmaceutical composition comprising ethinyl estradiol. The present invention also relates to a process for preparation of stable pharmaceutical composition comprising ethinyl estradiol. The present invention further relates to a stable pharmaceutical composition comprising ethinyl estradiol and progestogen. Background of the invention ¾ Oral contraceptives including the combination of gestagen and estrogen components are used for decades. Ethinyl estradiol is a synthetic estrogenic compound, chemically known as 19-nor- 17a-pregnal,3,5(10)-triene-20-yne- 3, 17-diol. Ethinylestradiol is currently marketed in the United States in combination with desogestrel (Kariva®, Desogen®, Cyclessa®, Mircette®); with drospirenone (Yasmin® and Yaz®); with levonorgestrel (Seasonique®, Loseasonique®, Seasonale®, Lybrel®); with norethindrone (Norinyl®, Ovcon- 35®, Ovcon-50®); with norethindrone acetate (Femhrt®) and with norgestimate (Ortho Tricyclen®, Ortho Tricyclen Lo®). Following are the references that disclose stable composition of ethinyl estradiol and its combination with progestogen. US Patent No. 4, 1 15,563 relates to a solid pharmaceutical formulation comprising from 5 to 80 percent by weight of a pharmaceutically active steroid, 1 to 8 percent by weight of sodium starch glycolate and the remainder conventional excipients. US Patent No. 4, 154,820 relates to a stabilized therapeutic preparation exhibiting no oxidation and less than about 5% hydrolysis up to at least 24 months, consisting essentially of at least one alkali metal sulfate salt of a synthetic conjugated estrogen and an antioxidant, wherein the preparation is maintained at an alkalinity corresponding to a pH of not less than about 7.0. US Patent No. 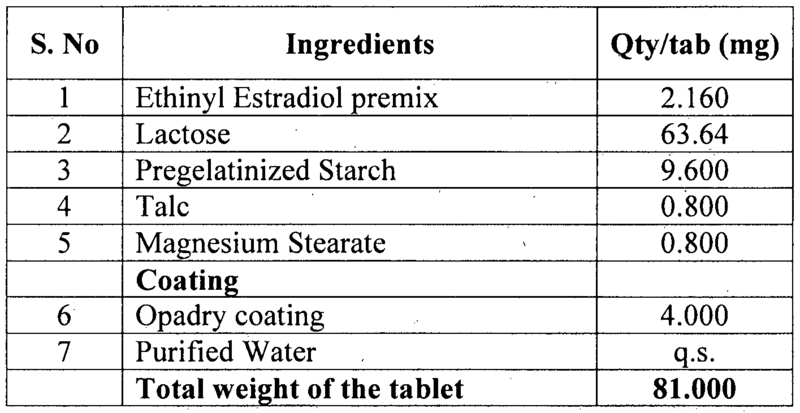 4,380,534 relates to a solid pharmaceutical composition containing less than 5 mg/dosage unit of a powdered microdose drug subject to changes in crystal form stability selected from ethinyl estradiol, the improvement comprising said powdered microdose drug being coated with a hydrophobic wax. US Patent No. 4,383,992 relates to a water-soluble inclusion compound formed by complexing beta-cyclodextrin with a steroid compound having a molecular structure smaller than the inside dimension of the internal cavity of beta-cyclodextrin. US Patent No. 4,727,064 relates to a method of producing a stabilized amorphous complex of a drug and a mixture of cyclodextrin, which comprises the steps of dissolving an intrinsically amorphous mixture of cyclodextrin derivatives which are water soluble and capable of forming inclusion complexes with drugs in water and solubilizing lipophilic drugs into the aqueous media to form a solution and form a solublized drug/cyclodextrin complex. US Patent No. 4,877,774 relates a method for administering steroid hormones to patient needing supplemental steroid hormones by direct contact with mucosa or the conjunctiva comprising contacting the mucosa of said patient with an effective amount of a steroid hormone complexed with crystalline gamma-cyclodextrin. US Patent No. 5,376,641 relates to water soluble compound formed by complexing branched beta cyclodextrin with a steroid having a molecular structure that can fit into the cavity of the branched beta cyclodextrin and form a complex with the branched beta cyclodextrin. US Patent No. 5, 134, 127 relates to a pharmaceutically acceptable composition comprising a pharmaceutically acceptable carrier and a clathrate complex comprising a drug complexed to a cyclodextrin derivative a pharmaceutically acceptable cation; wherein said composition contains not more than 5 wt. % of underivatized cyclodextrin. US Patent No. 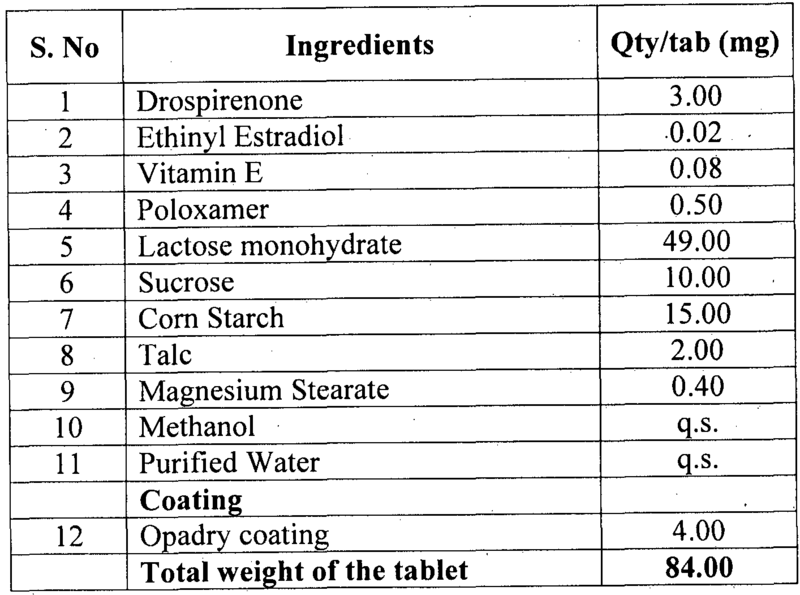 5,382,434 relates to dry pharmaceutical preparations containing ultra-low doses of micronized steroidal medicinal agents in combination with a primary excipient having a high binding affinity and low demixing potential for the steroidal medicinal agent including spray-dried polyalcohols, granulated a-lactose monohydrate and mixtures thereof. The patent further discloses that the dry methods (dry-granulation and direct compression) are especially suitable for medicinal compounds which are sensitive to moisture or are unable to withstand the elevated drying temperatures associated with wet-granulation methods. US Patent No. 5,543, 157 relates to a pharmaceutical composition comprising an effective amount of active/cyclodextrin inclusion complex with pharmaceutical agent selected from the group consisting of estradiol; estriol; ethinylestradiol-3 -methyl ether; ethisterone; and mixtures thereof, said complex being prepared by the kneading method and having a particle size of less than about 5 microns which provides for fast release of said pharmaceutical agent. US Patent No. 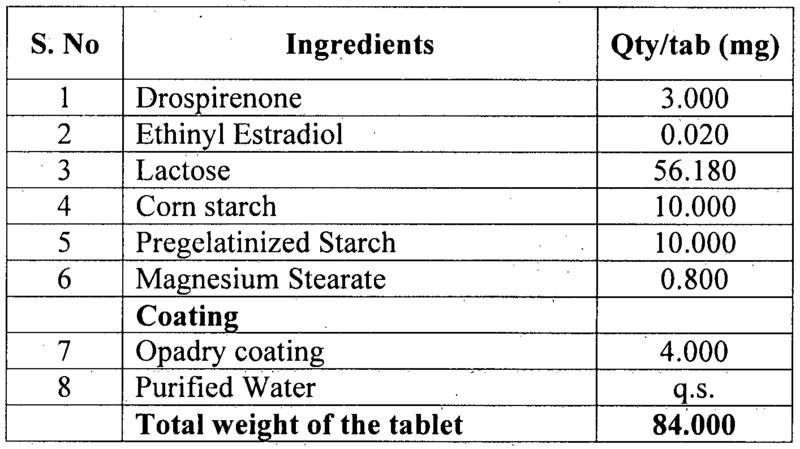 5,547,948 relates a compressed tablet comprising a tablet core containing conjugated estrogens and a sugar coating in which said sugar coating incorporates a hormonal steroid and a release rate controlling amount of microcrystalline cellulose. US Patent No. 5,798,338 discloses a composition comprising an effective amount of 17a-ethinylestradiol, and an amount of a β-cyclodextrin in the form of clathrate, effective in reducing the oxidative degradation of the 17a- ethinylestradiol. The patent discloses the use of clathrate of β-cyclodextrin for prevention of the oxidative degradation reactions of the active ingredient. US Patent No. 5,928,668 relates to a method of dry blend compression of insoluble potent drug substances using a directly compressible, agglomerated excipient that is not a conventional spray dried polyalcohol or lactose. The patent further discloses that the estradiol and a number of other low-dose potent drugs precipitate in a variety of polymorphs and/or crystal habits on drying (during wet granulation process), which can affect the bioavailability of the drug. US Patent No. 5,976,570 relates to a method for preparing solid pharmaceutical dosage units containing low dose active ingredients using a wet granulation technique which employs aqueous solvents and surfactants. US Patent No. 6, 156,341 relates to pharmaceutical agents that contain gallic acid ester as an antioxidant in combination with a steroidal active ingredient. US Patent No. 6,958,326 relates to a pharmaceutical a composition comprising a granulated preparation comprising a complex between an estrogen and a cyclodextrin, the composition having a stability such that said estrogen is in an amount of at least 90% w/w in relation to the initial content of said estrogen after storage for 12 months at 40° C and 75% relative humidity (RH); and the composition being essentially free of polyvinylpyrrolidone. US Patent Nos. 7,163,931 and 7,569,557 relates to a stable pharmaceutical product comprising an estrogen, comprising complexed estrogens or sensitive complexes between a cyclodextrin and an estrogen. The patent further discloses that the degradation of estrogens, such as ethinyl estradiol, in conventional products, is one of the most critical issues with regard to product shelf life. US Publication No. 2005/0020554 relates to a method of preparing a pharmaceutical dosage form, the method comprising (a) encasing a pharmaceutical dosage form comprising an estrogen in a container essentially impervious to oxygen, and (b) purging the container with an inert gas, and pharmaceutical dosage forms made by the method thereof. US Publication Nos. 2005/0207990, 2005/0220825, 2008/0175905 and 2009/01 17183 disclose compositions comprising an estrogen in combination with a progestin. Despite the achieved results as disclosed in above prior art references there is a need for such products of estrogen-gestagen combinations, which possess enhanced stability, homogenous distribution, and are easy to manufacture. The inventors of the present invention have developed a stable composition comprising ethinyl estradiol as active ingredient and sucrose as stabilizer which provides better or comparative, content uniformity, dissolution profile and/or bioavailability w.r.t commercialized dosage forms. The inventors have surprisingly found that the composition comprising ethinyl estradiol with sucrose as stabilizer is stable against thermal degradation, hydrolysis and oxidation of ethinyl estradiol. The main objective of present invention is to provide a stable pharmaceutical composition comprising ethinyl estradiol and one or more pharmaceutically acceptable excipients. Another objective of the present invention is to provide a process for the preparation of stable pharmaceutical composition comprising ethinyl estradiol having better or comparative dissolution properties, content uniformity and bioavailability w.r.t. 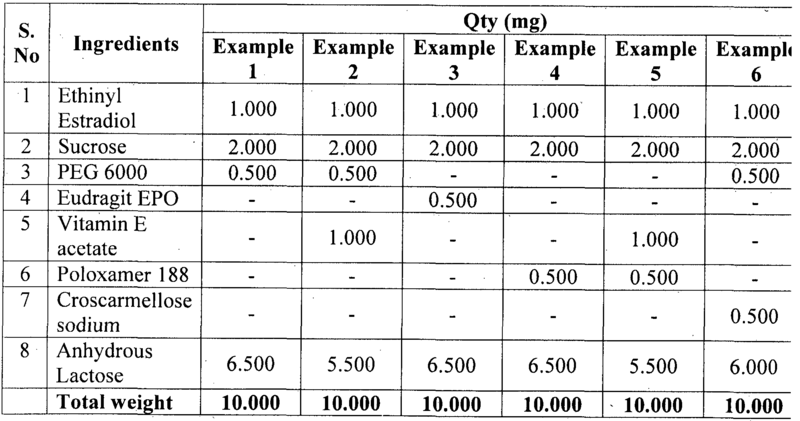 commercially available dosage form. Accordingly, the present invention provides a stable pharmaceutical composition comprising ethinyl estradiol, a stabilizer and one or more pharmaceutically acceptable excipients, wherein stabilizer is sucrose. In another embodiment, the present invention also provides a stable premix composition comprising ethinyl estradiol, a stabilizer and one or more pharmaceutically acceptable excipients, wherein stabilizer is sucrose. In yet another embodiment, the present invention provides a stable pharmaceutical composition comprising ethinyl estradiol, progestogen, a stabilizer and one or more pharmaceutically acceptable excipients, wherein stabilizer is sucrose. In another embodiment, one or more pharmaceutically acceptable excipients are selected from diluent, binder, disintegrant, stabilizers, surfactant, antioxidants, water soluble polymers, glidant and lubricant. In another embodiment, progestogen is selected from drosperinone, levonorgestrel, desogestrel, norethindrone, norethindrone acetate, norgestimate, norgestrel, cyproterone. In yet another embodiment, the present invention provides a stable pharmaceutical composition comprising ethinyl estradiol, a stabilizer and one or more pharmaceutically acceptable excipients, wherein stabilizer is sucrose or sucrose in mixture with other stabilizers. In yet another embodiment, the present invention provides a stable pharmaceutical composition comprising ethinyl estradiol, drosperinone, a stabilizer and one or more pharmaceutically acceptable excipients, wherein stabilizer is sucrose. In yet another embodiment, the amount of drospirenone used may be in the range from about 1 to about 5 mg and the amount of ethinyl estradiol used may be in the range from about 0.01 to about 0.05 mg. The stable pharmaceutical composition of the present invention is substantially free of surfactant. The present invention further relates to a stable pharmaceutical composition comprising ethinyl estradiol, a stabilizer, an antioxidant, a surfactant and optionally one or more pharmaceutically acceptable excipients, wherein stabilizer is sucrose. Ethinyl estradiol shows thermal degradation followed by hydrolysis and very much prone to oxidation also. The formulation of ethinyl estradiol with sucrose results in stable formulation. · Sucrose is classified as a non-reducing sugar and doesn't get oxidized by mild oxidizing agent. • Sucrose has a water activity of <0.8 which discourage the kinetic rates of many reaction. • Sucrose when solubilized in water shows negative heat of enthalpy which works as a "coolant" preventing thermal degradation. • Sucrose has high value of osmotic pressure which helps the carrier mediated transport of molecules across the cell membrane resulting in increased absorption. The present invention further relates to a stable pharmaceutical composition comprising ethinyl estradiol, progestogen, a stabilizer, a water soluble polymer, an antioxidant, a surfactant and optionally one or more pharmaceutically acceptable excipients. Suitable binders used according to the present invention are selected from the group comprising sucrose, cellulose and its derivatives including, ethyl cellulose, hydroxypropyl cellulose, hydroxypropyl methylcellulose, methylcellulose and hydroxyethyl cellulose, carboxymethyl cellulose; starch and its derivatives; hydrocolloids; sugars; polyvinyl pyrrolidone, copovidone, methacrylic acid copolymers and the like or combination thereof. The amount of binder may range from about 1-40%, preferably 1 -20% by weight of the dosage form. Suitable diluents used according to the present invention are selected from sugars such as lactose, sucrose, dextrose; sugar alcohols such as mannitol, sorbitol, xylitol, lactitol; Starlac® (co-processed mixture of Starch and lactose), Microcelac® (co-processed mixture of microcrystalline cellulose and lactose), starch, corn starch, modified starches, pregelatinized starch, dibasic calcium phosphate, tribasic calcium phosphate, powdered cellulose, microcrystalline cellulose, silicified microcrystalline cellulose and the like or combinations thereof. The amount of diluent may range from about 5-95%, preferably 10- 70% by weight of the dosage form. Suitable disintegrants used according to the present invention are selected from low-substituted hydroxypropyl cellulose; cross-linked polyvinylpyrrolidone; cross-linked sodium carboxymethylcellulose, sodium carboxymethylcellulose, microcrystalline cellulose; sodium starch glycolate; pregelatinized starch and the like or combinations thereof. The amount of disintegrant may range from about 1-30%, preferably 1-20% by weight of the dosage form. Suitable lubricants used according to the present invention are selected from calcium stearate, glycerol behenate, magnesium stearate, mineral oil, polyethylene glycol, sodium stearyl fumarate, stearic acid, talc, vegetable oil, zinc stearate and the like or combinations thereof. The amount of lubricant may range from about 0.01-5%, preferably 0.1-2% by weight of the dosage form. Suitable glidants of the present invention include calcium silicate, magnesium carbonate, magnesium oxide, magnesium silicate, talc, colloidal silicon dioxide, starch and the like. The glidant may be used in the range of 0.01 -5%, preferably 0.1-2% by weight of the dosage form. Surfactants are compounds which are capable of improving the wetting of the drug and/or enhancing the dissolution. The surfactants can be selected from hydrophilic surfactants or lipophilic surfactants or mixtures thereof. The surfactants can be anionic, nonionic, cationic, and zwitterionic surfactants. Surfactants according to the present invention include, but not limited to, polyoxyethylene alkylaryl ethers such as polyoxyethylene lauryl ether, polyoxyethylene cetyl ether, polyoxyethylene stearyl ether; polyethylene glycol fatty acid esters such as PEG monolaurate, PEG dilaurate, Polyethylene glycol 660 12- hydroxyl Stearate Ph.Eur. or Polyoxyl 15 hydroxystearate NF (Solutol HS 15), PEG distearate, PEG dioleate; polyoxyethylene sorbitan fatty acid ester such as polysorbate 40, polysorbate 60, polysorbate 80; sorbitan fatty acid mono esters such as sorbitan monolaurate, sorbitan monooleate, sorbitan sesquioleate, sorbitan trioleate, polyoxyethylene castor oil derivates such as polyoxyl castor oil, polyoxyl hydrogenated castor oil, sodium lauryl sulphate, monooleate, monolaurate, monopalmitate, monostearate, sodium dioctyl sulfosuccinate (DOSS), lecithin, stearylic alcohol, cetostearylic alcohol, cholesterol, polyoxyethylene ricin oil, polyoxyethylene fatty acid glycerides, poloxamer, cremophore RH 40, and the like or combinations thereof. The surfactant may be used in the range of 0.001 -5% by weight of the dosage form. Antioxidants prevent the oxidative degradation of substance. Exemplary anti-oxidants include, but not limited to, ascorbic acid and its salts and derivatives, vitamin E, vitamin E acetate, tocopherols and their derivatives, citric acid, gallic acid ester, butylated hydroxyanisole (BHA), butylated hydroxytoluene (BHT), di-tert-butylphenol, tertiary butylhydroquinone, aromatic amines, phenolic acids, enzymatic antioxidants, flavonoids, N- acetylcysteine, mesna, glutathione, thiohistidine derivatives, triazoles; tannins, cinnamic acid, hydroxycihnamatic acids and their esters, their mixtures and the like or combinations thereof. The antioxidant may be used in the range of 0.001-5% by weight of the dosage form. Stabilizers used according to the present invention include sucrose, sucrose fatty acid esters, polyethylene glycol, polyvinyl alcohol, xanthan gum, maltodextrin, EDTA, poloxamer, trehalose and the like or combinations thereof. Water soluble polymers according to the present invention include, but not limited to, polyethylene glycol, homopolymers and copolymers of N-vinyl lactams, especially homopolymers and copolymers of N-vinyl pyrrolidone, e.g. polyvinylpyrrolidone, copolymers of N-vinyl pyrrolidone and vinyl acetate e.g. copovidone, methyl cellulose, hydroxypropyl cellulose, hydroxypropyl methylcellulose, polyethylene oxide, polyacrylates, methacrylate copolymers, methyl methacrylate, butyl methacrylate and the like or combinations thereof. The water soluble polymer may be used in the range of about 0.01 to 10% by weight of the dosage form. The pharmaceutical composition according to the present invention may be prepared by any method known in the art such as melt extrusion, solid dispersion, solid solution, coprecipitation, wet granulation, melt granulation, dry granulation and/or direct compression. f) surfactant selected from poloxamer, sodium lauryl sulfate and polysorbate or mixtures thereof. h) glidant selected from talc, colloidal silicon dioxide. c) mixing the melt of step (b) with one or more pharmaceutically acceptable excipients, and d) cooling the blend of step (c) to room temperature and sifting the cooled blend. d) cooling the blend of step (c) to room temperature and sifting the cooled blend. c) compressing the blend of step (b) into tablets or filling into capsules. e) compressing the granules into tablets or filling into capsules. f) blending/lubricating the granules of step (c) and step (e) with one or more extragranular pharmaceutically acceptable excipients, and g) compressing the granules into tablets or filling into capsules. f) compressing the granules into tablets or filling into capsules. In an embodiment of the present invention, the solvents used for dispersion /solution may be selected from isopropyl alcohol, methanol, ethanol, water, acetone, methylene chloride and the like or mixtures thereof. "Dispersion" according to the present invention can be microdispersion or nanodispersion. The dispersion can be prepared and milled by any method known in the art. The solid dosage form of the present invention may be uncoated or or optionally coated. In yet another embodiment of the present invention, film coating composition comprises a solution / suspension of film coating polymers and one or more excipients such as such as plasticizers, opacifier, antisticking agent, colorants, sugars, pore forming agent, surfactants and the like. Suitable film coating polymers used according to the present invention are selected from ethylcellulose, hydroxypropylcellulose, hydroxypropylmethyl cellulose and the like or mixtures thereof. Suitable anti-sticking agents used according to the present invention are selected from talc, magnesium stearate and the like or a mixture thereof. The following examples further exemplify the invention and are not intended to limit the scope of the invention. It is obvious to those skilled in the art to find out the composition for other dosage forms and substitute the equivalent excipients as described in this specification or with the one known to the industry. 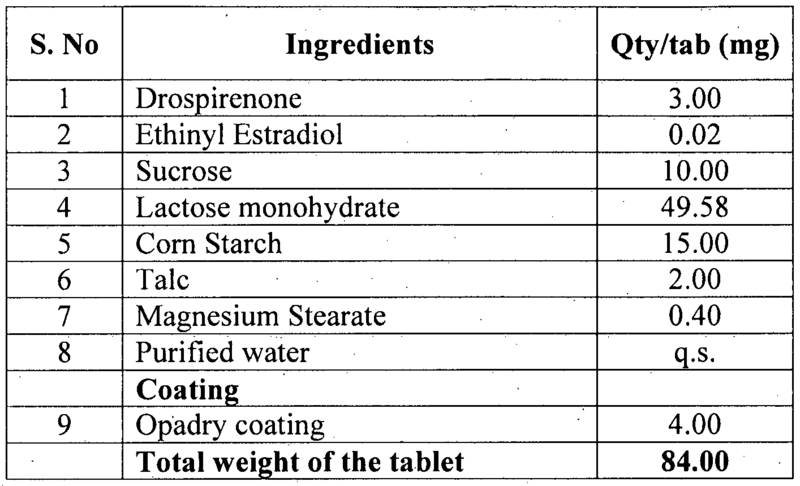 f) the compressed tablets obtained in step (e) were coated with Opadry coating. 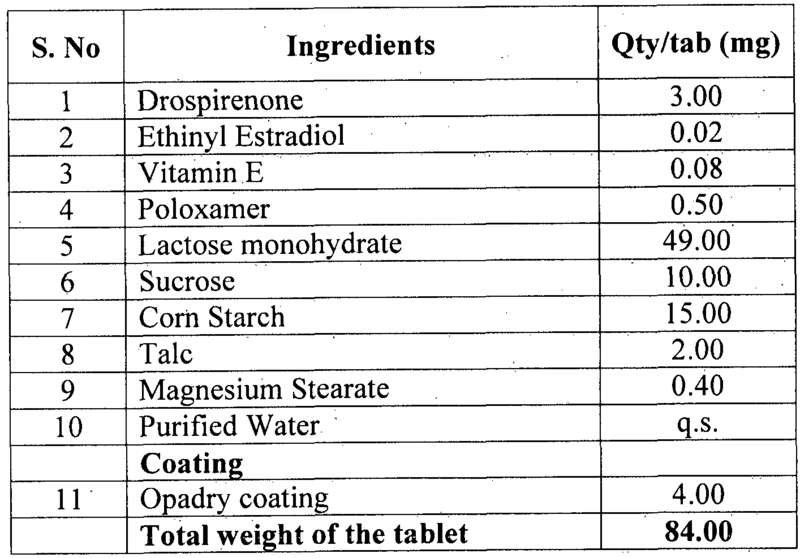 g) the compressed tablets obtained in step (e) were coated with Opadry coating. 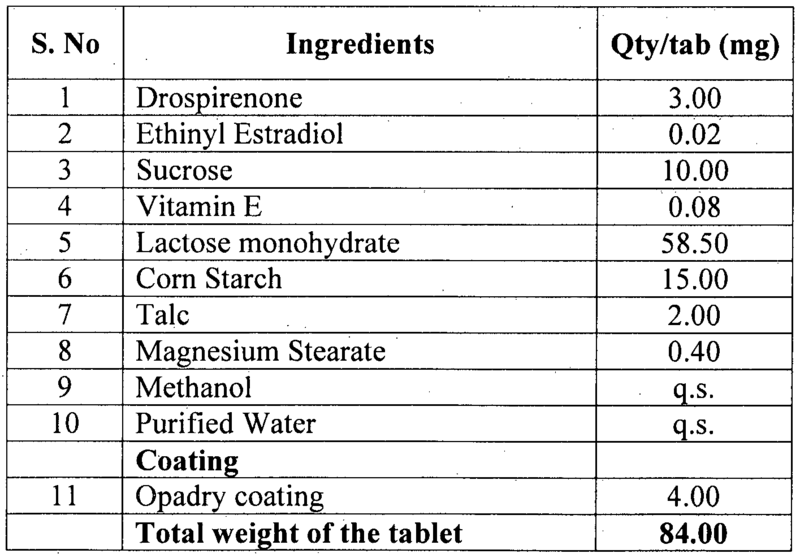 g) the compressed tablets obtained in step (f) were coated with Opadry coating. d) the blend of step (a) was granulated using the dispersion of step (c) and the wet mass was dried, milled and sifted. c) the lubricated blend of step (b) was compressed into tablets, and d) the compressed tablets obtained in step (c) were coated with Opadry coating. g) the lubricated blend of step (b) was compressed into tablets, and h) the compressed tablets obtained in step (c) were coated with Opadry coating. Stability Data: Tablets prepared according to examples 15 and 17 were stored at 40°C/75% RH for six months and then tested by HPLC to determine the amount of impurities such as 6-keto ethinyl estradiol and related impurities. The stability data is given in table 1. 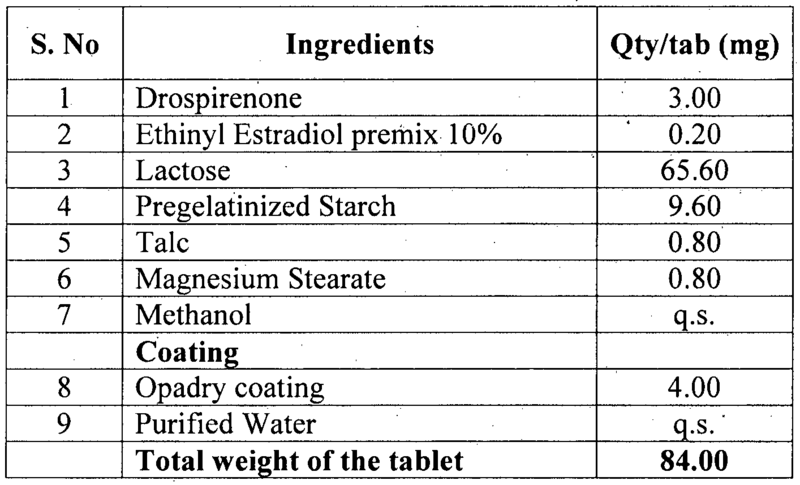 Stability Data: Tablets prepared according to examples 16 and 17 were stored at 50°C/75% RH for 5 days and then tested by HPLC to determine the amount of impurities such as 6-keto ethinyl estradiol and related impurities. The stability data is given in table 1. 1. A stable pharmaceutical composition comprising ethinyl estradiol, a stabilizer and one or more pharmaceutically acceptable excipients, wherein stabilizer is sucrose. 2. A stable premix composition comprising ethinyl estradiol, a stabilizer and one or more pharmaceutically acceptable excipients, wherein stabilizer is sucrose. 3. A stable pharmaceutical composition comprising ethinyl estradiol, progestogen, a stabilizer and one or more pharmaceutically acceptable excipients, wherein stabilizer is sucrose. 4. The composition of claim 1, wherein one or more pharmaceutically acceptable excipients are selected from diluent, binder, disintegrant, stabilizers, surfactant, antioxidants, water soluble polymers, glidant and lubricant. 5. A stable pharmaceutical composition comprising ethinyl estradiol, a stabilizer and one or more pharmaceutically acceptable excipients, wherein stabilizer is sucrose or sucrose in mixture with other stabilizers. 6. The composition of claim 3, wherein the diluent is selected from lactose, sucrose, dextrose; sugar alcohols such as mannitol, sorbitol, xylitol, lactitol; Starlac® (co-processed mixture of Starch and lactose), Microcelac® (co- processed mixture of microcrystalline cellulose and lactose), starch, corn starch, modified starches, pregelatinized starch, dibasic calcium phosphate, tribasic calcium phosphate, powdered cellulose, microcrystalline cellulose, silicified microcrystalline cellulose or combination thereof. 7. The composition of claim 3, wherein the binder is selected from cellulose and its derivatives including, ethyl cellulose, hydroxypropyl cellulose, hydroxypropyl methylcellulose, methylcellulose and hydroxyethyl cellulose, carboxymethyl cellulose; starch and its derivatives; hydrocolloids; sugars; polyvinyl pyrrolidone, copovidone, methacrylic acid copolymers or combination thereof. 8. The composition of claim 3, wherein the antioxidant is selected from ascorbic acid and its salts and derivatives, vitamin E, vitamin E acetate, tocopherols and their derivatives, citric acid, gallic acid ester, butylated hydroxyanisole (BHA), butylated hydroxytoluene (BHT), di-tert-butylphenol, tertiary butylhydroquinone, aromatic amines, phenolic acids, enzymatic antioxidants, flavonoids, N-acetylcysteine, mesna, glutathione, thiohistidine derivatives, triazoles; tannins, cinnamic acid, hydroxycinnamatic acids and their esters, their mixtures and the like or combinations thereof. d) cooling the blend of step (c) to room temperature ,and sifting the cooled blend. c) compressing the granules into tablets or filling into capsules, and d) optionally film coating the compressed tablet.